Built over a thousand years ago, Angkor Wat and the surrounding temples are a symphony of engineering and sculpture. For centuries they were hidden from most of the world, slowly being engulfed by the jungle. Today, Cambodia's artistic treasures can be admired in their full glory with over 100 temples to explore within the Angkor complex. Investigate the stunning Angkor Wat, the most famous temple complex; erected before 1150 AD this temple-complex is one of the most intricate and dramatic religious structures ever constructed by man and are unquestionably one of the wonders of the ancient world. Be enthralled by Ta Prohm with its haunting vines and fig trees which have created strange shapes as they wrap themselves around the temple complex, the amalgamation of wild jungle and beautiful stone temples creates a dreamlike effect that will leave a truly lasting impression. Stroll atop the Elephant and Leper King Terraces, ancient stone platforms believed to have been used for public ceremonies during the reign of the Khmer Empire. Gaze in awe at the temples of Banteay Srei, considered by many to be the jewel in Angkor's crown and the most sublime of all Angkor's ruins, delicately worked in pink sandstone with exceptional carvings and ornamentation. 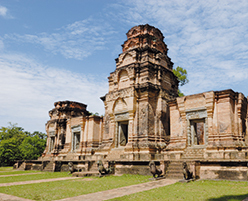 As you discover the treasures of Angkor you cannot help but feel a sense of awe at the artistry and extravagance of this long-gone civilization. It is an ideal destination for those seeking to explore the splendor of Asia's past, present, and future. Located in the tropical zone north of the equator, Cambodia has a monsoon climate. Monsoon season runs May - November, meaning that the most pleasant season for visitors is generally the dry season, stretching from November/December - April. Immediately after the monsoon, the blanketing green of the countryside can be stunningly beautiful.